Surviving Surprises; Fly the Airplane and then Work the Problem – EHFC Members Talking! 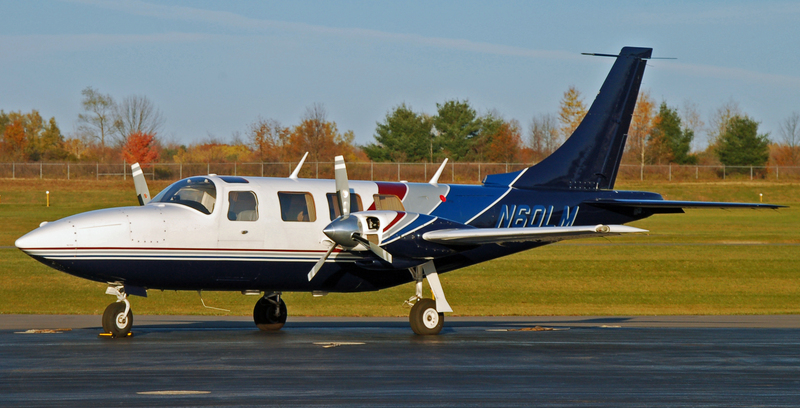 N60LM is a 1979 Aerostar, a six place pressurized twin engine airplane that Mike Newman and I have owned for about 17 years. We can cruise at over 220knots and can fly pressurized to 25,000ft. I was solo IFR at 19,000ft about 70nm east of our home base, KITH. The plane recently finished its annual inspection and I was thinking that the plane was running really well — very smooth, temps where they should be. Life was good — finally! With no warning, the left propeller goes to flat pitch and the RPM takes off and goes through redline. The Aerostar has controllable pitch propellers similar to what’s on the club’s Mooney. There is a prop governor on each engine where that is used to set the engine RPM. As power is increased or decreased, the pitch of the propeller automatically changes to maintain the rpm setting. The prop governor has a maximum setting of 2,575 rpm. Going overspeed by as little as 10% for less than a minute can easily destroy the engine. I pulled the left throttle back immediately, pulled the prop control to feather and pulled the mixture control as well. I grabbed the yoke, jammed in right rudder and increased power on the right engine. All this is taught to multi-engine pilots as rote. At altitude, you have some time to make decisions and normally wouldn’t immediately shut down the engine, but I was concerned about blowing it up, so I worked quickly to get things under control. I radioed Boston Center and told them I was making a 180 and heading back to KITH with an engine failure and requested an immediate descent clearance to 16,000 ft. I was already in a descending turn when they gave me the clearance. The single engine service ceiling on the Aerostar is 16,000ft. So I knew it wouldn’t stay at 19K and a single operating engine couldn’t keep the cabin pressurized. However, there was a problem. The left prop was windmilling. It didn’t go into feather. The RPM was still up there, just under redline. I started slowing down to reduce the descent rate and reduce the speed of the windmilling prop. I also increased the power on the right side, 2400rpm and 36″MP (nearly climb power), and full rich mixture. Got down to about blueline (best single engine rate of climb – 117knots in the Aerostar) and the groundspeed dropped off very quickly. I asked for and got a clearance down the 14,000 ft. This all happened in under 3 minutes. At that moment, it dawned on me that with a windmilling prop, I might not be able to find a power setting and airspeed where the plane would fly level. I tried various airspeeds and power settings (nearly to full power -350hp) – figuring that the least drag from the windmilling engine would be somewhere in the vicinity of blueline. But, try as I might, I couldn’t find a combination at that altitude where the plane would fly level. At that point, the plane was controllable about 115-120knots but the descent rate continued at about 350-400fpm. Think of a windmilling prop as a large piece of plywood in front of the engine creating an enormous amount of drag. You can’t get too slow or the plane will literally roll over and out of control. And with a windmilling propeller, the higher the airspeed, the more drag is created. By this point, I was heading back generally in the direction of KITH, kind of following the reverse line on the GNS 530. I also knew there were four possible airports to land at between my location and KITH. (Oneonta, Norwich, Hamilton, and Cortland) But, because of the way the plane was handling and the windmilling engine, I wasn’t going to give up any more altitude until I had to. I punched in direct KITH into the GPS. I wanted to see if I could it back to KITH. One setting we keep in the GNS 430 is the vertical speed required for a descent that will end up 1000ft above and 3nm from the field. It showed about 550fpm required. We normally use this feature to plan VFR descents. So I knew that if nothing changed, I could make KITH and be at or above pattern altitude. I also knew there were very few hills between me and KITH, nothing more than 1000AGL. – The closest four airports would me require giving up a lot of altitude right now, something that I really didn’t want to do. I knew Cortland is only 12 miles east of KITH. If the altitude calculations somehow didn’t work, that would be my final alternate. – I also figured that the plane should fly better as I descended into thicker air. – The weather was VFR along the route with haze, some cumulus clouds and no significant surface winds. – I totally know the terrain and obstacles around Ithaca. Under the circumstances, it would present the fewest surprises. As I came through 14,000’, I asked for 11,000 and told the controller that I didn’t know if I’d be able to maintain that altitude when I got there. The controller seemed not to understand the situation and said he could only clear me to 11 (the top of Boston Center airspace in that area). So, I declared an emergency…told the controller what my plan was and to give me bearing and distance to each of the four airports along the way with my goal of landing in KITH (having the longest and widest runway available). After the fuel on board, and souls report, ATC was very helpful. There’s a lot of trepidation and discussion about declaring an emergency. There really needn’t be. By doing so, I could tell ATC what I needed, what my plan was, what the plane could do and not do. They could keep traffic out of the way and if needed provide me with immediate vectors to any of the four airports along the way. Also, if something “bad” happened, they knew where I was and could call out emergency crews. After what seemed like forever (20 minutes), I found myself passing Cortland, only 12 miles east of KITH. By that time, the plane would fly level at about 37-38”MP (climb power in the Aerostar, about 85%) on the right engine at about 120Kts indicated. CHTs were in the 400 degree range at full rich. Rolled onto final at KITH at about ¾ miles out right on the GS. (I did have time to load the ILS 32 approach into the GPS and activated it.) Dropped the gear, no flaps, and used right engine power to control the descent. Touched down doing about 105Kts. Power was probably at about 27” at touchdown. Used about 5,000’ to get stopped, but could have used less. Of course, the airport safety equipment was there right behind me and followed me right to the ramp. I even remembered to thank tower controller and asked him to convey thanks to the approach controllers and the folks up the line. It didn’t take too long to figure out that the left prop controller had failed by swapping the right controller over to the left side. I looked at our logbooks and noted that both prop controllers had over 1,400 hours on them and were 10+ years old. We had our local shop order two replacements which were installed. And since the overspeed wasn’t more than 10% and was for less than 3 seconds, we didn’t have to comply with the Lycoming Overspeed Service Bulletin, although we decided to change the oil, check for metal in the filter, clean all the filters, do a compression check, clean the plugs, borescope the cylinders, and do an oil analysis just to make sure that no damage was done. None was. The plane was returned to operation and everything is working. So, this was a pretty successful outcome under the circumstances. Now the rest of the story! About two hours after landing, Roger Dennis, owner of Taughannock Aviation and a long-time friend comes into the shop. We’re talking about what happen and he asked: “Did you consider restarting the left engine?” Honestly, NO I hadn’t. I had worked out the plan given the windmilling engine, speeds, etc. and made it work. Then, it hit me — did I do it the best way? Over the next several days, I spoke to several other long-time charter pilots, put a posting onto the Aerostar forum, dug through the Aerostar flight manual, and other Aerostar materials looking for a better way. I also looked at various other reports of windmilling propellers on the Internet, finding a few articles and NTSB reports where those flights had ended badly. – Two other Aerostar pilots reported that SimCom (one of the national simulator training facilities) has a procedure where the windmilling engine is not shut down, but essentially a combination of airspeed and power on the good engine is found where the bad engine is maintained a zero thrust. Zero thrust is the same a feathered propeller. Twins are designed to be able to fly in this configuration and multi-engine pilots are taught how to operate in a single engine environment. Even at idle power or a bit above idle, the left engine thrust would be at or near zero. Little or no drag. Same as a feathered propeller. With a bit more power on the left engine, I could have found an airspeed/power combination where the left engine wouldn’t overspeed. The plane would have easily maintained altitude and would have been much easier to fly (once I got below the single engine service ceiling). Choosing an airport would have been much more straight-forward. Declaring an emergency would likely have not been necessary. The plane was light – a good 700 pounds under gross weight. I happened to be just far enough away to make Ithaca. I knew the terrain and the area very well. I had enough experience to know that there was a speed that would minimize drag, minimize the descent rate and keep the plane under control. Even with the windmilling propeller, down low, the plane would fly reasonably level. Although I’ve done extensive training in the Aerostar over the 17 years we’ve owned the plane, this scenario wasn’t part of any training curriculum I had been through. It wasn’t in any of the multi-engine training I had done either. I had my plan and I was sticking to it. I never considered that there might be other options. Sometimes, you don’t have time to consider other options. This time, I did. I hadn’t read everything written about the airplane. When I received the preliminary Aerostar Training Manual, I did read through it – just not carefully enough. The bottom line is that there is always much to learn and I found that I need to be more open to studying the experiences of others, so when the next strange occurrence happens, I’ll be better prepared. Sounds like a very interesting flight. Glad it was you and not me. for Link simulators for a while long before I even knew what a simulator was. Wow, larry…..great write-up. If I ever do multi engine, I will KEEP all this in mind! I am thinking this advice applies to all multis in some sense? Correct?